Hello everyone! Here’s a quick July progress report as to where I’m at with the Milwaukee Brewers historical book. In early July I finished up my own edits on the manuscript. I had printed it in the spring and read through the whole thing, trying to put myself in a reader’s shoes. I did some editing on paper – and that felt pretty good to take that route after previously editing exclusively as I wrote. Since then I have been working on compiling a list of sources for each quote in the book. This is probably something I should have done while I was writing, but I got pretty consumed with that process and didn’t feel like breaking off to do it then. It just felt good to write and not have to deal with anything else. So now I’m dealing with it! I had an unexpected bit of press coverage about the book in early July. Matthew Prigge of Shepherd Express in Milwaukee reached out to me on Twitter and asked if I’d be interested in doing an interview. For those not in the know, Shepherd Express is a newspaper/website based in Milwaukee. Matt interviewed me via email and was extremely helpful throughout the process. I really enjoyed myself. The interview is not in the physical newspaper, but did wind up in the Around Milwaukee section of the website. You can read it here. Big thanks to Matt for reaching out to me and providing me with my first real press coverage on the book! 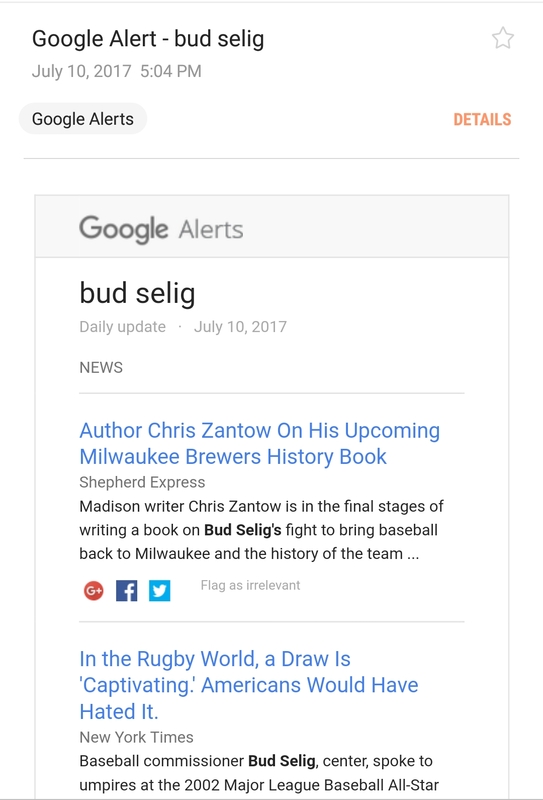 A while back I set a Google alert for Bud Selig – just to see if anything interesting might come across that could potentially go in the book. As a result of the interview being posted, I wound up as part of the Selig daily alert. You can see it below. My deadline to turn the manuscript over to McFarland is August 31. Barring any unforeseen circumstance, I expect to meet that deadline. Then I’ll move into a new phase of the publishing process and will let you know exactly how that goes. I’ll provide another short update late in August right here! Thanks for sticking with me!